Not your typical academic writer, Christopher Castellani has stuck closer to the streets in his work and in his art than most graduates of MFA programs. The director of Grub Street, a Boston creative writing program outside of academia, Castellani practices what he teaches and he’s good at both. His latest novel builds on his two previous novels (A Kiss from Maddalena and The Saint of Lost Things), bringing some of his earlier protagonists to the brink of their mortality and others into the prime of their lives. His focus here is the Grasso family, composed of Antonio and Maddalena, immigrants from Santa Cecilia, a mountain town outside of Rome and their children, Prima, the late Tony, and Frankie. Antonio makes his living at the Al di La restaurant, which he hopes will stay in the family when he dies. He was grooming his first son, Tony, for the job, but Tony takes things into his own hands, disappointing his father, the only one who knows the real reason why Tony opts out. The loss of Tony affects each of the Grassos differently, but all of them with the same intensity. The choices they make in their lives are all tied to the trauma of losing Tony. Prima, a wild girl in her teens becomes a responsible housewife, raising three sons with a successful ‘merican husband, becomes a mother obsessed with her boys and with the idea of taking her parents back to Italy one more time before they die. Frankie, a graduate student in English, is away at school, but finds any excuse he can to come back home to his family, the only place where he feels connected to the world. A true mama’s boy, Frankie doesn’t have what it takes to run the restaurant, and does what he can to avoid dealing with the loss of his older brother. Antonio can’t do anything but run the restaurant until Maddalena starts needing him more and more at home. Maddalena drowns her grief in dance classes and daily phone calls with Frankie, and does all that she can to separate herself from her Italian past. When Prima surprises them all with tickets to return to Italy, Antonio is ecstatic, Maria is adamantly against it, and Frankie sides with her. The tension around this proposed trip drives each of the Grassos into different ways of coping with the others. And in this tension, the novel moves in interesting directions. Castellani is a master at telling each character’s story without depending on one more than the other. In this way, we get a rich account of the dynamics at work in this Italian family that takes them through practical and dysfunctional behaviors. In this way, the author captures family love like no other. The novel becomes a beautiful way of seeing the real world, certainly more challenging and revealing than anything that reality television has served up. 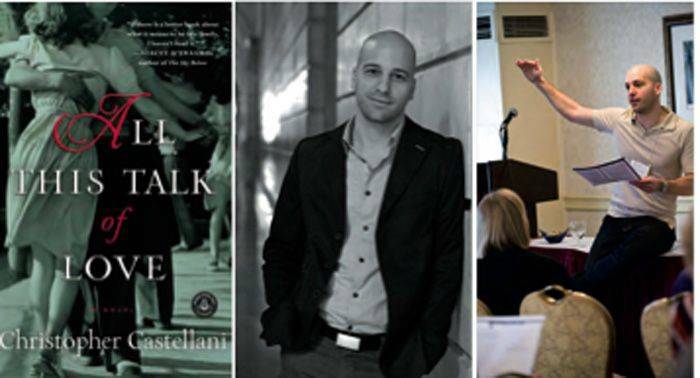 Castellani takes us all for a spin around the emotional block that encircles the relationships our family creates both within and outside our homes. As Maddalena ages, she begins to lose track of things, and Antonio takes it upon himself to protect her from a diagnosis of oncoming dementia. Just when you think Prima’s plan is lost, something happens to reverse Maddalena’s feelings and the family heads off on a trip back to the Old Country, but it becomes something that none of them had imagined. More than completing a triology, All This Talk of Love, caps character development at its best. Through simple language, even when dealing with Frankie’s experience in graduate school, Castellani weaves a complex net of actions that takes the immigrant saga well beyond timeworn plots, showing us all that becoming American effects, but doesn’t erase, our being Italian.